Are you stumped about why a stump is recommended as great addition to a child-friendly backyard? A stump can be a lot of things. A chair, a table or best yet, a woodworking center. 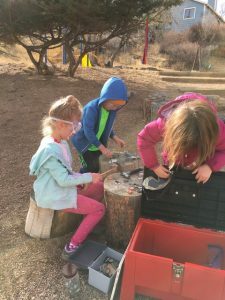 With a stump, some basic tools and Ruth Washburn woodworking centers as inspiration here are some ideas for using a stump to stage a variety of activities. Before introducing the stump as a woodworking area, be sure to provide safety goggles or glasses for your child. Children will need adult supervision while working with tools. Practice hammering! Begin by introducing the parts of a hammer. Children can usually guess which part is the claw. Introduce the face, the head and the handle. Hold the hammer near the head and demonstrate “tap, tap, tapping” a nail to get it started. Move your hand down the handle of the hammer and “pound, pound, pound” until the nail is driven into the soft surface of the log. Children will love to tap, tap, tap and pound, pound pound. A gentle way to begin hammering is by using golf tees, a wooden mallet and stiff styrofoam. Children can learn that a nail can be used to attach two things together. Have available bottle caps, paint strip samples, pieces of cardboard or cloth squares to hammer onto the log. Pumpkins provide a very easy surface for hammering. Once children can drive a nail into the stump, they may want to practice hammering wood scraps. And then hammering wood scraps together. At this point they have begun to build. Have plenty of wood scraps available. Our family still has the wood sculpture (doorstop!) our now twenty-nine-year-old son made at Ruth Washburn as a four-year-old. Once in a while, after all this hammering, you may want to introduce the claw and it’s function to remove nails and hammered items to keep the surface of the log clear. Provide wood glue, wood scraps and a glue brush. 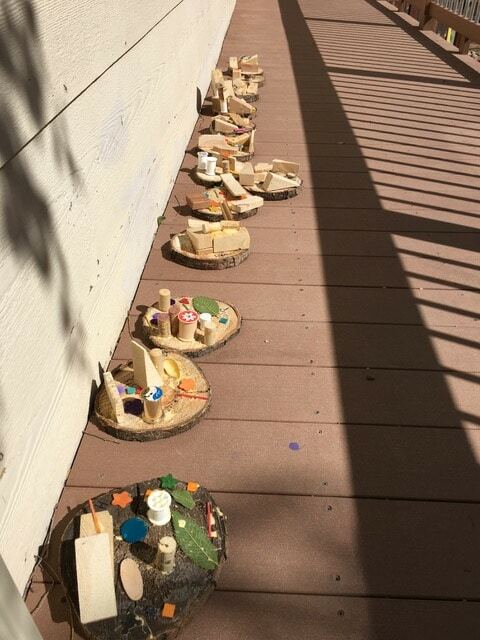 Children can glue together wood pieces to make imaginative sculptures. These will become castles, “the tallest sculpture in the world”, a playground, a boat. Build on your child’s creations by providing paint a second day and more wood glue and decorations of recycled materials including corks, plastic lids and natural items such as leaves collected by your child. “Tree cookies” make great bases for wood sculptures! Your stump can be used as a table for art projects. 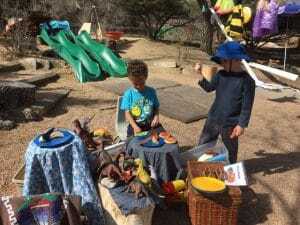 Or cover your stump with a table cloth, invite all your favorite dinosaurs and have a picnic! A stump can be rolled from place to place. Tools other than hammers can be used on the stump. Introduce Phillips and flat he ad screwdrivers and screws. Cardboard pieces work well for a child to practice attaching with screw drivers and screws. Use a hand drill to make wooden beads. Children can be taught to use a saw under watchful supervision of an adult. Try sawing corn stalks or branches. Together with your child you can make a set of natural blocks. I am just sure your child will come up with his or her own original ideas for using a stump in the backyard. Happy hammering!